Despite easy access, the complex and dynamic geometry of the nose makes reliable and efficient delivery of drugs to mucosal surfaces high and deep in the nose challenging. The nasal valve is the narrowest segment of the respiratory tract, accounting for up to 80% of nasal resistance and almost half of total respiratory resistance. Sniffing causes additional narrowing of the elastic tissues of the valve. Both traditional spray pumps and pressurized metered-dose aerosols deliver a dose of medication primarily to the anterior segment of the nasal passage, which is lined with skin-like epithelial cells. Much of the remaining medicine that does get past the nasal valve is drawn along the floor of the nose, under the inferior turbinate bone, by sniffing. 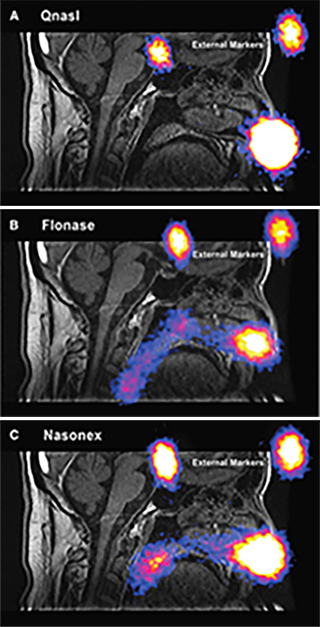 Effective, targeted drug delivery for many therapeutic applications requires reaching the high and deep part of the nasal passages, which means drug must be delivered beyond the nasal valve and above the inferior turbinate bone to reach the broad surfaces lined by lung-like respiratory epithelium that surround sinus openings and where the nerves from the brain penetrate to carry sense of smell. The nasal valve area, located 2-3 centimeters into the nose, limits the amount of particles that are able to penetrate farther. The high velocity of the particles leaving a traditional spray pump or pressurized aerosol also causes the larger particles in particular to hit the valve region rather than float through and around the obstructing structures. Additionally, the relatively wide plume angle of the mist leaving the nozzle may also reduce the distance the drug particles travel and cause drug to simply impact the sides of the nose before even reaching the nasal valve. Using a pressurized device to try and force drug in “harder” may simply exacerbate this problem. With currently available corticosteroids, given the amount of spray delivered close to the nasal opening, it is not surprising that a considerable portion of the total drug dose is deposited in this region, where it may drip and be wiped away or eventually be blown out of the nose. Depiction not for comparative purposes. Reprinted with permission from JOURNAL OF AEROSOL MEDICINE & PULMONARY DRUG DELIVERY 28/8, 2015, by Leach et al, published by Mary Ann Liebert, Inc., New Rochelle, NY. The percentage of drug that is transported toward the back of the nasal passages has been shown to be mainly cleared along the floor of the nose, limiting its exposure to the entirety of the mucosal surface area where interchange with the cells and circulation takes place. Sniffing, which is recommended with many nasal sprays and which frequently takes place naturally to avoid drip-out, can cause a large part of the dose to be drawn rapidly into the throat, where it is lost to swallowing. Optinose Exhalation Delivery Systems use a unique Bi-Directional™ mechanism of action designed to reliably and effectively deliver medications or vaccines high and deep throughout the nasal passages. Leach CL, Kuehl PJ. Human clinical nasal deposition and retention from nonaqueous and aqueous steroid inhalers. Resp Drug Deliv. 2016;1:193-202.